Since I’m well aware you deeply admire the work of Brooke and Steve Giannetti, it’s extra exciting to celebrate the release of their book, Patina Living this week! Patina Living & Loving: European Farmhouse Style is my tribute to this third installment in the Patina trilogy which contributes warmth, heartfulness, and hopefulness too often in short supply within the design world. Patina Living (Gibbs Smith, 2019). Photographs by Victoria Pearson from Patina Living by Brooke and Steve Giannetti, reprinted by permission of Gibbs Smith. Book Review & Rustic modern farmhouse and lifestyle inspiration…certainly lovely indeed. 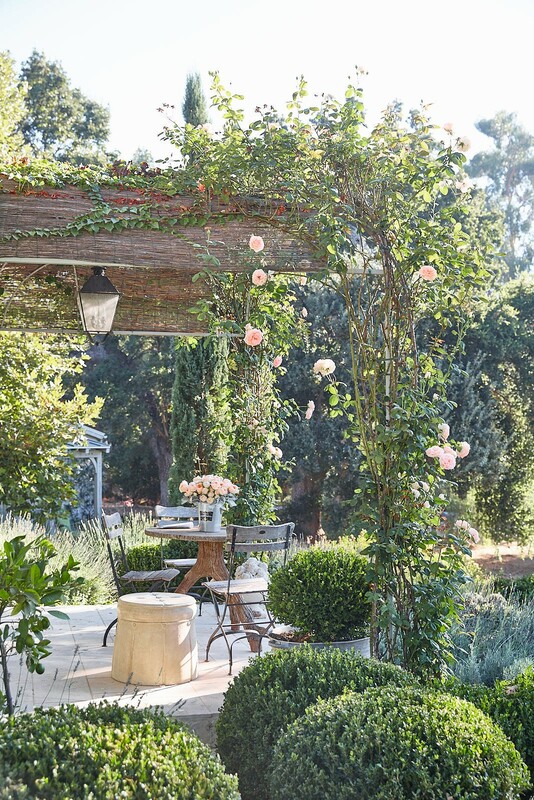 Patina Living & Loving: European Farmhouse Style in California. PLEASE CLICK TO PIN THIS POST to spread the love for Patina Living! As I type these words, my guys can barely contain their joy about Game of Thrones premiering tonight, but me? 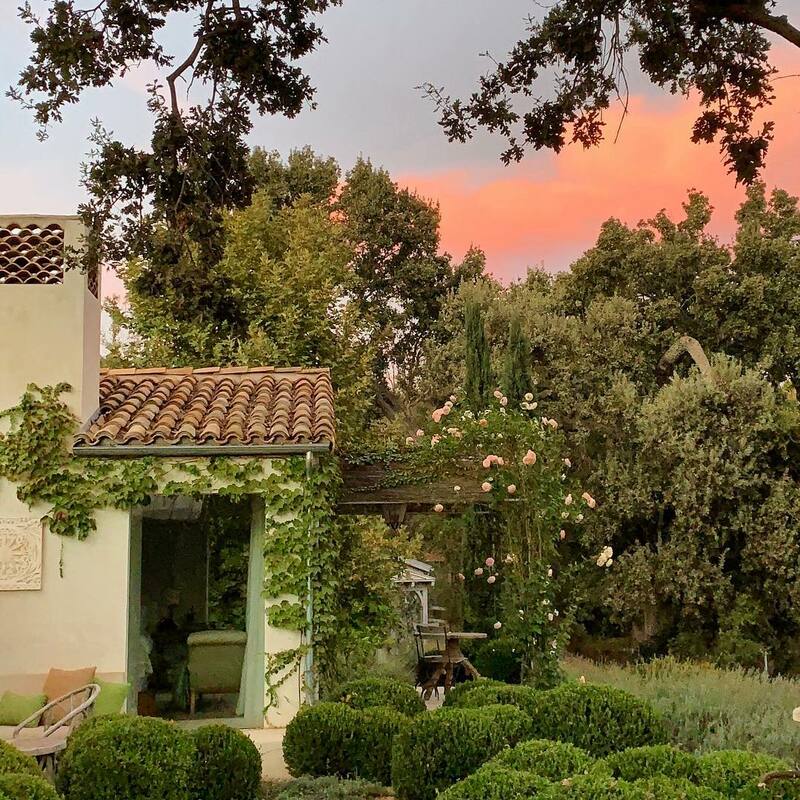 Let me soak in the European farmhouse inspired beauty inside and out at Patina Farm, a thoughtfully designed and picturesque small family farm in Ojai, California. You do have your copy of Patina Farm, right? Remember when the interiors were taking shape!?! 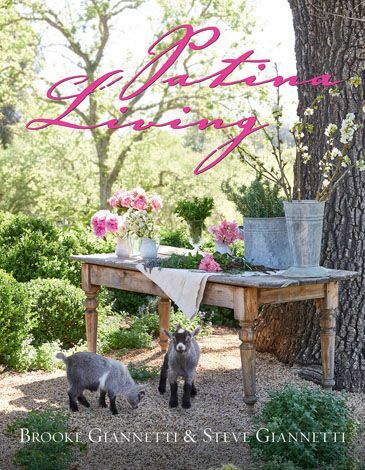 Inside Patina Living is a gorgeous von gorgeous collection of images, recipes, anecdotes, and snapshots of organic and un-fussy Cali French farmhouse life. If you’re a longtime follower of Brooke Giannetti’s Velvet and Linen, you likely delighted in the construction chronicles of Patina Farm as well as the adoption updates as goats, donkeys, sheep, and chickens brought fullness of life and love to the landscape. Photo: Brooke Giannetti/VelvetandLinen. Book Review & Rustic modern farmhouse and lifestyle inspiration…certainly lovely indeed. Patina Living & Loving: European Farmhouse Style in California. Brooke and Steve’s vision of pastoral tranquility for their family led to more than a European country infused farmhouse with tasteful design elements and architectural details…their dream inspired others to dream! I could ramble on about why I love their aesthetic and lifestyle philosophies since both have richly inspired me over the years…but let’s get to the new pretty patina-ed glimpses! Peek Inside Patina Living’s Pages! Are we interested in how Patina Farm’s gardens grow? Oui, oui. But will we French farmhouse freaks also be treated to interior loveliness? Yep. Oh, Patina Farm dining room, I could get used to your lofty ceiling height. Patina Living (Gibbs Smith, 2019). Photographs by Victoria Pearson from Patina Living by Brooke and Steve Giannetti, reprinted by permission of Gibbs Smith. Can we imagine primping in a pale and lovely spot like this? 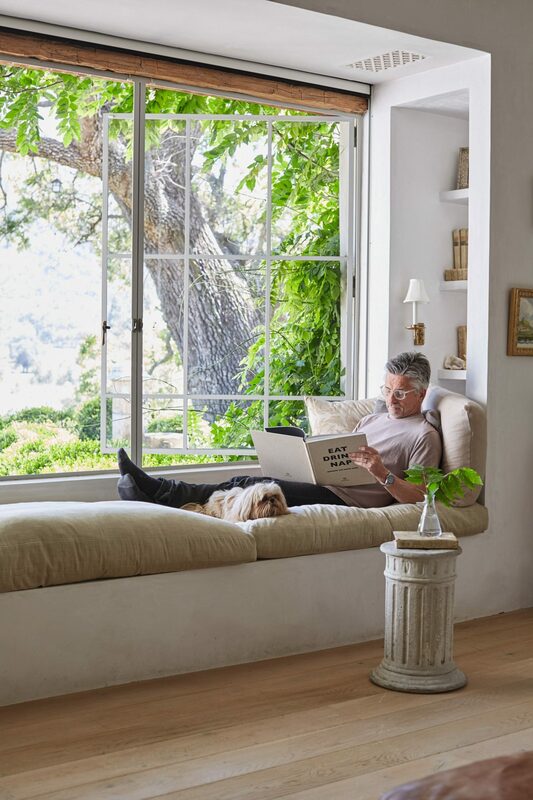 Would you choose to get literary or lounge-y with a gentle breeze? 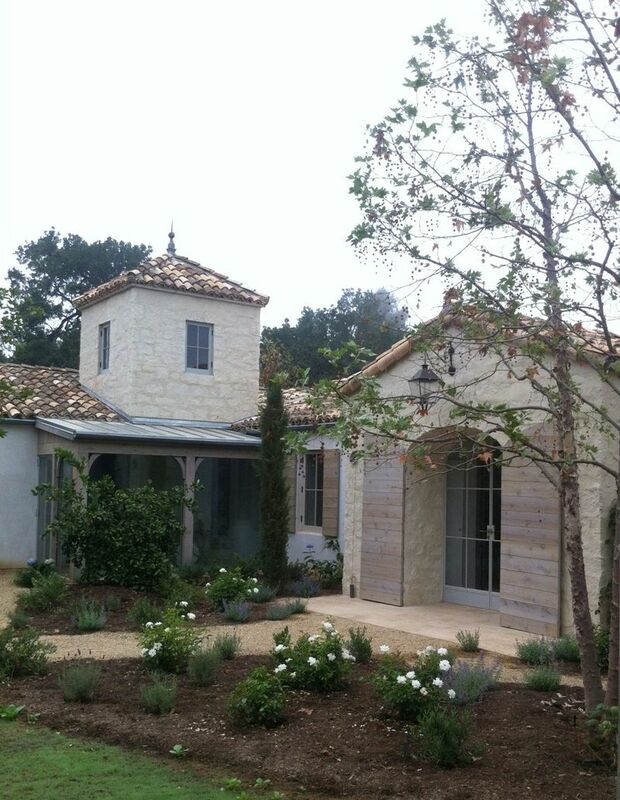 While the inside of Patina Farm may be laid-back luxe, the outdoors are lovely lush! If beautiful country gardens and climbing roses take your breath away, you’re in for a treat! 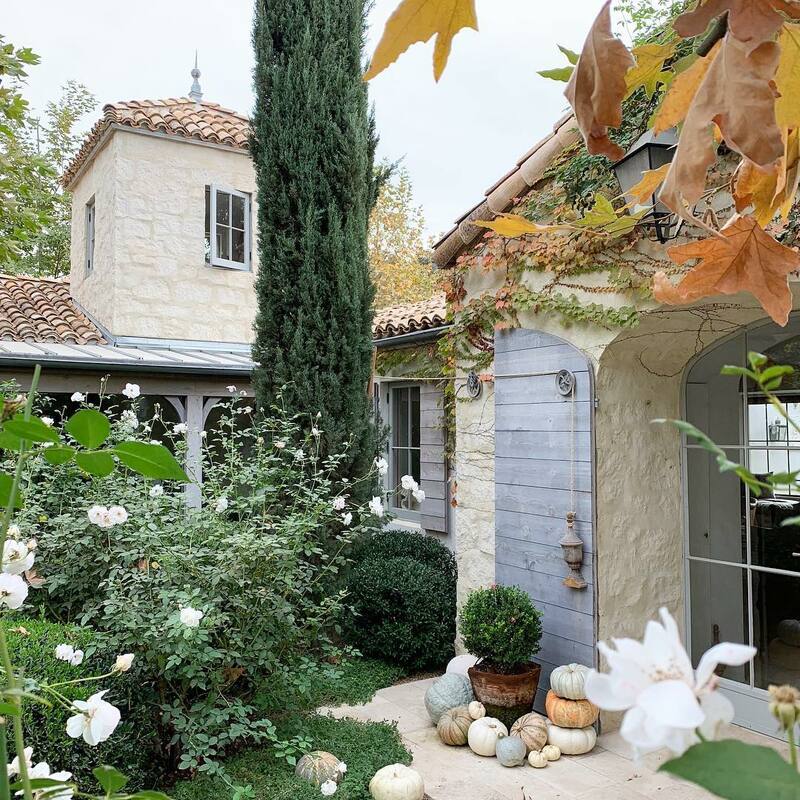 I love the peeks Brooke shares of Patina Farm in autumn! Photo: Brooke Giannetti/VelvetandLinen. Rustic modern farmhouse and lifestyle inspiration…certainly lovely indeed. 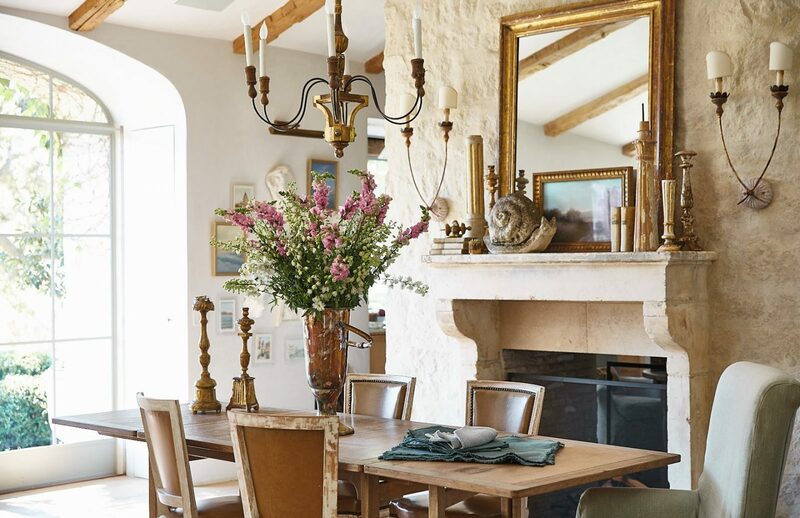 Patina Living & Loving: European Farmhouse Style in California. Feels like yesterday the Giannettis began planting their gardens! You’ll delight in Patina Living’s visual treasury of natural farmhouse beauty since it glows with the sort of warmth that can only develop with time and true tenderness. The PATINA TRILOGY…it’s how the cool kids rock their coffee table. Check out this PINTEREST BOARD to score more European farmhouse inspiration and save to your own boards! Thanks so much for reading and celebrating the Giannettis today! Peace to you. Ha – sure seems close! Happy new week, friend.